Ruby often made clothing for her grandchildren. Each summer she would make them shorts outfits and every Christmas she would make flannel pj's for them. My mother recalls that the flannel pj's smelled like the wood burning stove that was always running at Ruby's house. Ruby would make dresses for herself and on special occasions she would make them for others. Always thrifty, she would make patterns herself out of newspaper. She used a treadle machine to sew these dresses and it is still in the family today. Ruby always kept her change in a piece of cloth that she knotted to keep together. When the grandchildren would come to visit her, she would give them a nickel so that they could walk to the service station and buy an ice cream cone. As children, they thought it took forever for her to un-knot that cloth and pull the coins out. Ruby made incredible sorghum cookies that were the size of saucers. When her grandchildren were older they would often make special trips with their friends to Ruby's house to see if, by chance, she had made any sorghum cookies recently. During the holiday season, Ruby, who was always clad in an apron, would decorate these cookies with colored sugars and cut them into fun shapes. Ruby had a couple sayings that still make us laugh today. If someone didn't meet her definition of an upstanding citizen she would say that they "had the morals of an alley cat". Any time her grandchildren got in trouble she would call them "little pups". To this day, my cousin thinks of Ruby every time she sees a Bit O'Honey. Ruby also like that neapolitan striped coconut candy. In her later years, my aunt recalls setting up a video camera (cars and telephones were new technology when Ruby was young) to the TV that was off to the side in her room. My uncle sat in front of her holding the camera and talking. She tried to respond to him, but was distracted and more than a little tickled by seeing and hearing herself on the TV. It was a fairly new technology at the time and it must have been amazing to see. Ruby kept an interesting calendar. Evey day she would write the weather, temperature, visitors, and major events in the daily squares. Sadly, it is believed that not of these calendars still exist. 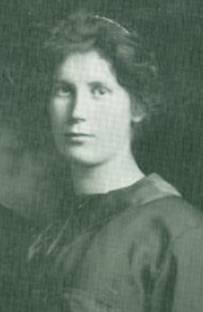 According to Ruby's obituary, she was born May 8, 1895 in Richland County, Wisconsin to John and Estella (Haskins) Dyer. I have been able to verify through land records that her parents were living in Richwood Township, Richland Co., Wisconsin during this time period. 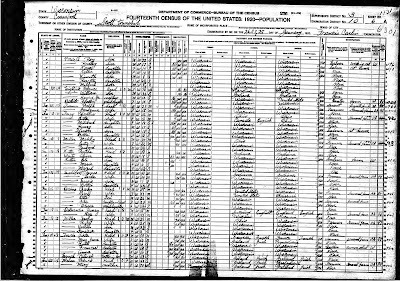 1900: The first record I have found of Ruby's existence is in the 1900 US Census for Richwood Township, Richland Co., Wisconsin. In this Census, 4 year old Ruby is living with her parents, John and Estella, and is the middle child of 5 siblings: William, Glen, Ruby, May, and June. 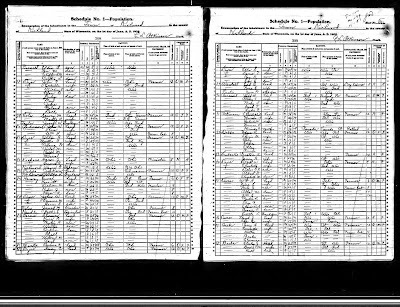 1905 Wisconsin State Census: We find a 10 year old Ruby living in a house with her parents, John F. and Estella, on their farm in Richwood Township, Richland Co., Wisconsin. 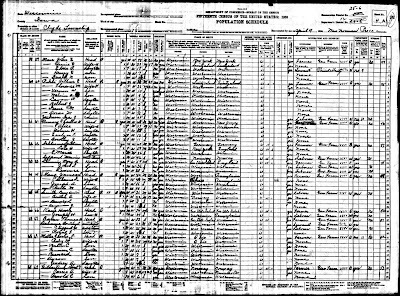 The family expanded since the last census, adding 2 children, Roland (4) and Dolly (1), to the 5 children previously listed in the 1900 US Census. 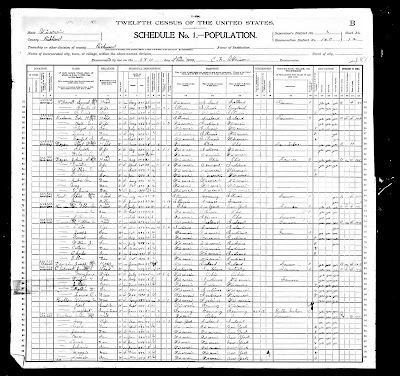 1910: In the 1910 United States Federal Census we discover that the family continued to expand, this time adding children Artist (5) and Estel (3). The family is still living and farming in Richwood Township, Richland Co., Wisconsin. 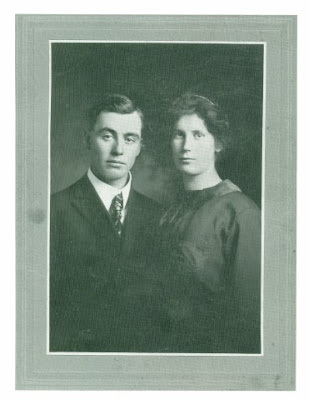 1915: According to Ruby's obituary, on August 11, 1915 Ruby M. Dyer married Charles Francis Miller in McGregor, Iowa. The photo above was taken on their wedding day. My maternal Grandmother displayed this photo for years in her house. I always liked it, but only recently learned that it was their wedding photo. 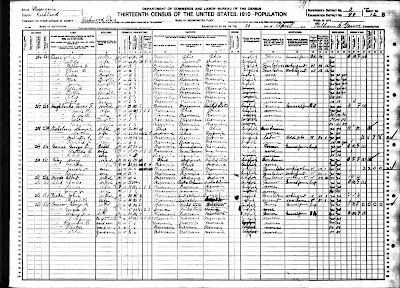 1920: The 1920 Unites States Federal Census is the first record I have been able to find that shows Ruby as a married woman. She is listed with her husband, Charles, in Scott Township, Crawford Co., Wisconsin. Having grown up in this area, I know that Scott Township is only a few miles from where Ruby's parents were living in Richwood Township. Charles and Ruby have two children in this Census, Verlin (3) and Genevieve (2). 1930: Charles and Ruby moved between the 1920 and 1930 US Censuses. In the 1930 United States Federal Census we find them living in Clyde Township, Iowa Co., Wisconsin. During this time, Ruby became pregnant two more times. The first pregnancy resulted in twins Bernard and Byron, and the second, daughter Audrey. 1990: Ruby died in 1990 at the Boscobel Memorial Nursing Home. She was a member of the Reorganized Church of Latter Day Saints and was a homemake throughout her life. Ruby and her husband Charles, share a headstone in Haskins Cemetery, Richland County, Wisconsin. Family and Friends, please leave any memories you have of Grandma Ruby in the comment section below. This way, we call all enjoy them together. I like your Ruby and your way of presenting her. Fantastic biography! I like that you added photos, documents, and all the interesting little traits she had - really makes her come alive, even for someone who didn't know her. Thanks for your post - I enjoyed reading it. What a great way to present a biography of your ancestors. A model for others to follow, for sure. Great read! I have nominated your blog for the Ancestor Approved Award - You can stop by AncestorSoup.blogspot.com to pick it up, and learn more. Thanks for some great posts! An interesting and wonderful blog. Congratulations from CHMagazine.